In light of the recently released torture report summary, we’re reminded that no government official ever went to jail for the years of systematic abuse – except for John Kiriakou, the CIA whistleblower who exposed the use of waterboarding. 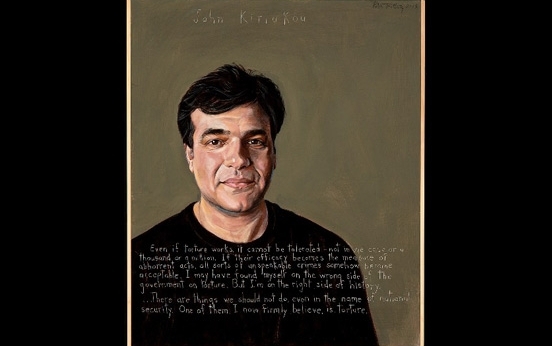 During his 23 months behind bars, Kiriakou was constantly threatened with diesel therapy (disorienting prisoners by frequently moving them to different locations) for writing letters describing prison’s deplorable conditions. Kiriakou was recently released, yet remains on house arrest where he is routinely harassed by law enforcement. The witch-hunt cost Kiriakou his pension, his dream home, and nearly two years of his life. Yet he says he would do it all over again if it meant going down on the right side of history. I went to Kiriakou’s home for an interview about the torture report and accountability for the architects, in which he gives a grave warning to American citizens. Right before Kiriakou went to prison, he came on Breaking the Set to talk about Obama’s war on whistleblowers and “look forward, not backward” policy regarding the Bush administration’s egregious war crimes. It is beyond surreal that the only government official ever prosecuted in relation to the torture program is the man who exposed waterboarding to the media. Kiriakou may be free from his cell, but until every person involved in the top down implementation of these horrific crimes is sitting in theirs, there won’t be anything remotely resembling justice. When white Anglo-Saxon males fear the same government-endorsed brutality and subjugation as native-born Hispanics and African-Americans, then the REAL revolution can finally begin.